Since 2010, India has produced a billionaire every 33 days. Many of these are self-made first-generation entrepreneurs, who command both, position and power, on the world economic platform. 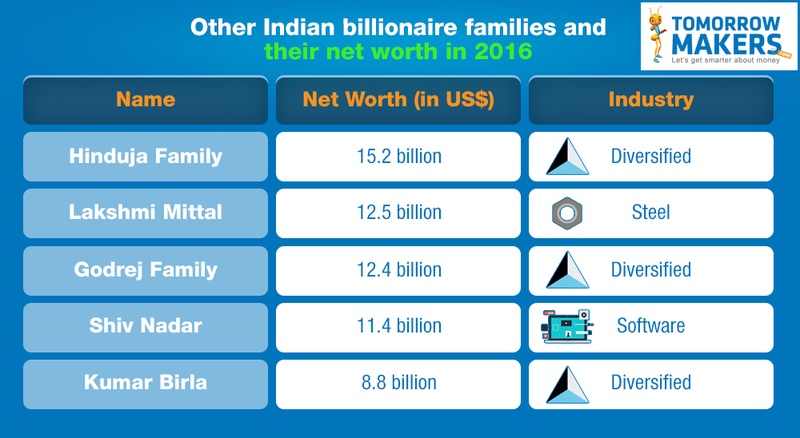 On International Family Day, we look at some of India’s richest families and a brief history on how they’ve achieved what they have. The late Dhirubhai Ambani was a first-generation entrepreneur. His success story took him from Gujarat to Aden (Yemen) and then to Mumbai where he started a textile business. He focused on building world-class infrastructure for textile production in India. His eldest son, Mukesh Ambani, is the richest man in India today, and his family has a total net worth of $30.2 billion. Meanwhile, Mukesh’s younger brother, Anil Ambani, has a net worth of $3.3 billion. Today, Reliance Industries affects the country’s GDP directly, and creates huge employment opportunities. Lesson to learn: Diversify. Don’t limit yourself to one thing—be it business or investment. A leading player in the pharmaceutical industry, the Shanghvi family has a total net worth of $16.9 billion. It all started when Dilip Shanghvi founded Sun Pharmaceuticals with a friend. Today's billion-dollar business was once a small wholesale outlet in Kolkata that started with just five products. The first manufacturing unit Shanghvi established in Gujarat produced psychiatric medicines. Today, he ranks eighth amongst the 50 most powerful Indians of 2017. Lesson to learn: Start small, and keep investing time and effort. Your business is then sure to grow. This family practically led India into the era of information technology. Originally founded by Mohamed Premji, Wipro was a vegetable and refined oils manufacturer. Today, the current owner- Azim Premji (Mohamed Premji’s son) and his family have an impressive net worth of $15 billion. Azim Premji realized early in his career that his interest lay in IT, and decided to pursue it aggressively. Realising that IT was the future, he converted his father’s business and worked to strengthen it. He even collaborated with Sentinel to improve its market outreach, thus, building one of India’s biggest software and technology services companies. Lesson to learn: Know what you want. Set your goals. Then, work towards it. Owning 18.4% stakes in Tata Steel takes the net worth of this family to $14.6 billion. With a construction business that is flourishing across India and Ireland, this family is involved in many partnerships. In 2016, the Indian government awarded Pallonji Mistry the Padma Bhushan for his contribution to trade and industry. His son, Cyrus Mistry, has served as chairman of Tata Group. Pallonji rose to fame by constructing some of the India’s most iconic buildings, including the Reserve Bank of India, Bombay Stock Exchange, and Taj Mahal Hotels. Lesson to learn: Invest. Your primary business may be successful, but investing in other successful companies can earn more rewards. A common theme runs through these success stories. Every family didn't just depend on working hard, but made their money work hard for them! So, what does that mean for you? How would you shape your billion-dollar dreams? Dig deep: Find gaps in existing industries that interest you, and step forward to exploit those opportunities. Invest time and money in what you believe in. The lure of success, and the desire to achieve something and provide a better life for your family is what will keep you going. Innovate: Many services and products are yet unknown in India. The founders of Flipkart and Ola rose to fame and riches by introducing new concepts that people wanted, such as modern ways of shopping and commuting. Work on something that can be the next big thing. Invest: The rich know how to best use their money, so learn from them. Invest profits from one business in another. Put your savings in different asset classes. Even if the amounts are small, put them into instruments such as Systematic Investment Plans (SIPs), which allow relatively low investments. Gift yourself the power of compounding. Trade shares: Invest in equities or buy blue-chip shares, and then wait for them to reap dividends over the next few years. You can also consider trading if you understand the stock market well, which can help you earn short-term profits. Becoming a first-generation entrepreneur and a billionaire is not easy. You need to focus on your goal and strive to achieve it. But then again, it isn’t impossible. Disclaimer: This Article is intended for general information purposes only and should not be construed as investment, insurance, tax or legal advice.You are encouraged to separately obtain independent advice when making decisions in these areas. Copyright ©  Transamerica Direct Marketing Consultants Private Limited. All Rights Reserved.